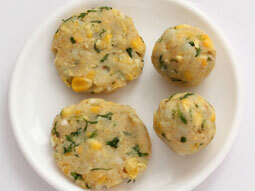 Make a delicious change to your spicy aloo tikki preparation by adding sweet corn to its preparation. 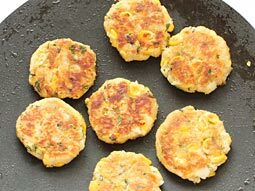 This easy corn tikki recipe uses a spicy paste of sweet corn, garlic, ginger and chillies, which gives a new dimension to this famous Indian street food’s taste and texture. 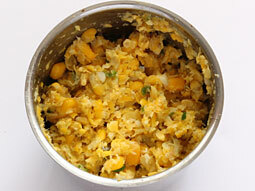 Coarsely grind 3/4 cup boiled corn kernels, ginger, garlic and green chillies and make a corn paste. Take mashed potatoes to a large bowl. 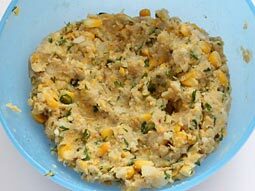 Add breadcrumbs, corn paste, 1/4 cup whole corn kernels, coriander leaves, garam masala, lemon juice and salt. Mix well. Grease palms with oil and divide mashed potato-corn mixture into 12 equal portions. Roll each portion into ball and flatten it to make round shaped 1/3 inch thick pattie. Heat non-stick frying pan (tawa) or griddle over medium flame for shallow frying. Add 2 tablespoons oil and spread it. Place 6-7 patties over it and cook over medium-low flame until bottom surface turns golden brown or for approx. 2-3 minutes. Flip them and cook another side until golden brown. 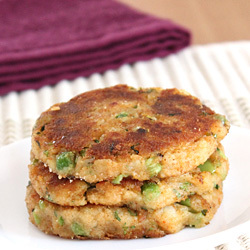 Transfer prepared tikkis to a plate and shallow fry remaining patties. 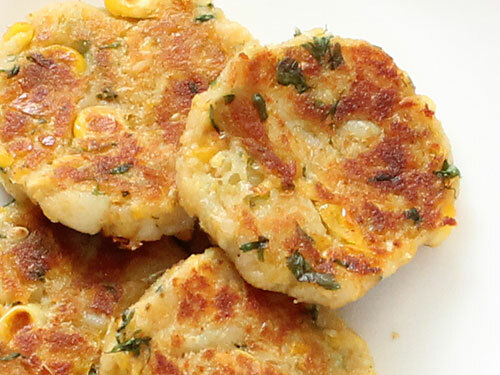 Corn tikkis are ready for serving. Serve them hot with tomato ketchup and assortment of chutneys. Do not flip tikkis until bottom side is golden brown otherwise it may break while flipping. You can peek into its bottom by gently sliding flat tawa spoon under it and lifting it slowly. Add 3 tablespoons fresh bread crumbs or crushed corn flakes or crushed oats if dry breadcrumbs are not available. Add boiled and crushed peas in mashed potatoes for variation. If you want them to be crispier, then deep fry instead of shallow fry. Make sure that oil is hot enough while deep frying otherwise pattie may break apart. 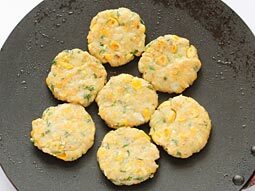 Serving Ideas: Serve shallow fried sweet corn tikki with green coriander chutney or tomato ketchup as afternoon snack. Pack them in lunch box for kids. Response: Hi Shubhangi, thanks for trying the recipe. To prevent tikkis from turning soft follow the following steps. 1. If the crushed corn mixture looks watery, cook it for 4-5 minutes until it turns almost dry and after that mix it with the potato and bread crumbs. 2. Add more bread crumbs.